In case you didn’t know, yesterday, April 20th or 4/20, was “Weed Day.” 420 is, of course, a coded reference to marijuana use, and in order to observe properly the pot smokers’ national holiday, Walking Shadows released on DVD yesterday Reefer Madness: 75th Anniversary Ultimate Collector’s Edition (cover pictured). Originally released in 1936 as Tell Your Children, the film is celebrated as a classic of anti-marijuana propaganda, depicting innocent (i.e., naïve) high school kids being duped into trying marijuana by unscrupulous pushers. As a consequence of marijuana use, the teens are propelled down a road of vice and—given the fact that such cautionary films are inevitably plotted as an apocalyptic sequence, as a Platonic deviation from the Good—death. Happily, Walking Shadows’ Collector’s Edition includes several bonus shorts, including High on the Range (originally released as Notch Number One, 1924), Betty Boop in Happy You and Merry Me (1936), Marihuana: Sins of Youth (1936), That Funny Reefer Man (1936), the feature length Marijuana: Threat or Menace? (1939), Hemp for Victory (1942), The Pusher (1951), and other shorts. If anyone is interested, several months ago I compiled a chronology of the rise of cannabis culture, available here. 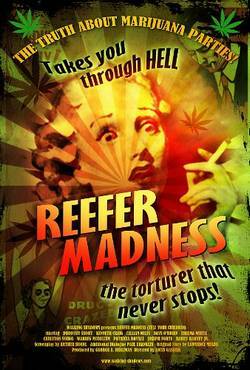 But remember: If you smoke it...You will GO INSANE!